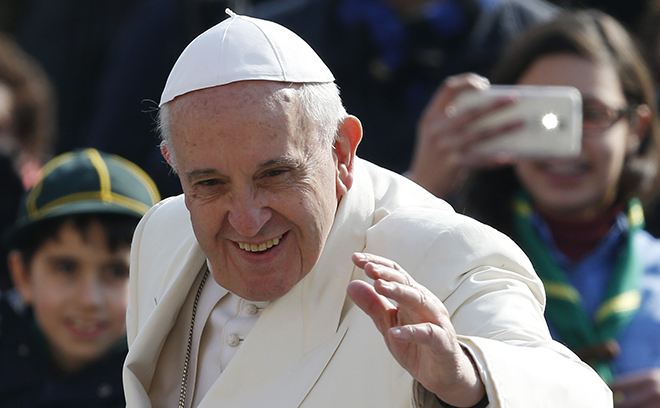 DON’T pack it in or shift into cruise control, Pope Francis told his fellow seniors. Today’s frenetic world, especially young people and families, needed the older generation’s prayers, wisdom and gifts to give them the encouragement, hope and faith they often lacked, he said at his weekly general audience on Wednesday (March 11). “We, older people, can remind ambitious young people that a life without love is barren. We can tell fearful young people that worrying about the future can be overcome. We can teach young people who are in love with themselves too much that there is more joy in giving than receiving,” he said to those gathered in St Peter’s Square. The Pope continued a series of audience talks about the family with the second part of two talks dedicated to the elderly, looking at the important role they play in modern society and the family. The 78-year-old pope said he would use the pronouns “we” and “us” when talking about the elderly since “I, too, belong to this age group”, recalling with a smile how during his visit to the Philippines in January, the people there called him “Lolo Kiko – that is, Grandpa Francis”. “It’s true that society tends to discard us, but the Lord definitely doesn’t. The Lord never rejects us,” he said. In fact, there was a true vocation and mission set aside for older people, who have a lot more free time at their disposal now than before, he said. “It’s still not time to ‘rest on one’s oars'” and just coast along, he said. Being older was certainly different, and so when it came to finding one’s new purpose in the world, seniors needed to sort of “make it up” as they went along “because our societies are not ready, spiritually and morally, to give this period of life its full worth”. Even “Christian spirituality has been taken a bit by surprise, and it involves sketching out a spirituality of older persons”, he said. There were plenty of saints as role models, he said, especially the elderly Simeon and Anna in the temple, who had the knowledge and wisdom from life’s journey to recognise Jesus. When they saw Jesus, “the weight of age and waiting disappeared at that moment”, and they found “new strength for a new task: to give thanks and bear witness to this sign of God”, the Pope said. Just as Simeon found inspiration to sing out with joy and Anna became the first to preach of Jesus, “Let us also become poets of prayer, let us acquire a love for looking for our words” to offer, as inspired by the Word of God. The prayers of the world’s grandparents and older people were “a great gift for the Church” and they offered “a great infusion of wisdom for all of society, too, especially for (those who are) too busy, too occupied, too distracted”. Pope Francis remarked how wonderful it was that Pope Benedict XVI “chose to spend the final stretch of life in prayer and listening to God. This is beautiful,” he said to applause. “It is truly a mission for grandparents, a vocation for older people,” he said, for them to hand down their wisdom and offer encouragement to those who were searching for meaning in life. Pope Francis said he was praying for “a Church that challenges the culture of disposal with the overflowing joy of a new embrace between young and old people”. A grandparent’s words were so important, he said, telling his audience how he often read a letter, which he keeps in his breviary, that his grandmother wrote him for his priestly ordination because “it does me good”.